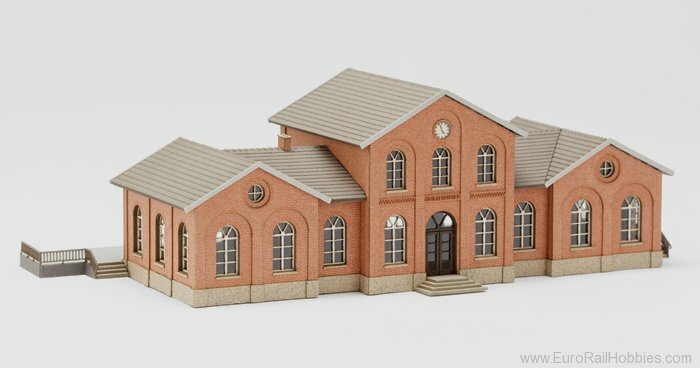 Archistories model sets are produced professionally, carefully and with loving attention to detail. They are very robust, warp free and made from especially high quality dyed architecture cardboard and precisely cut by laser. Additional colour treatment is not necessary, however teh models can be weathered with no problem. Platform set with railing elements for easy extension of the products 'Torrnstein station' (item 108131) and 'station Wolkenstein' (item 116131), consisting of an extension of the platform and two central platforms with roofs on a solid support structure. To mount an LED lighting, the roof racks can be laid invisibly in the Holhäumen cables. One of the middle platforms has a staircase.